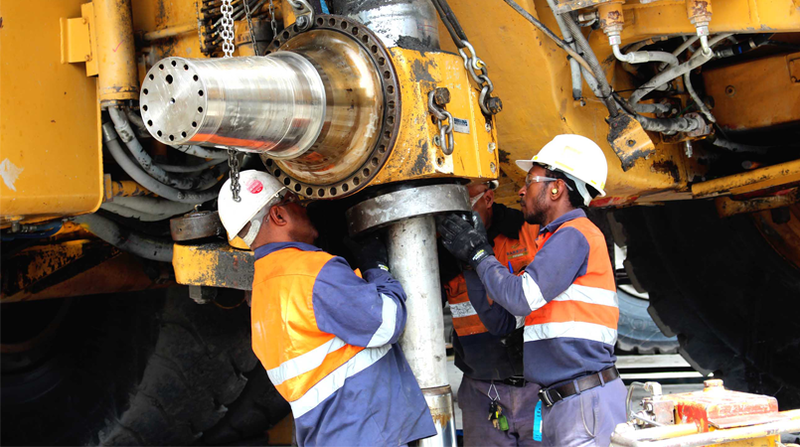 Locals from Porgera in Enga Province have expressed their thanks to Barrick Niugini Limited (BNL) after completing the mining companies recruitment training program. Initiated in 2016, BNL’s ‘Job Ready Program (JRP),’ has successfully passed 120 Porgera locals who completed four weeks of basic skills training. The training has resulted in 72 locals securing permanent employment within the Porgera joint Venture. The remaining are either on temporary roles or undergoing some form of further training respective to the job placement requirements. Amanda Larap, from Yarik village which is located in the Special Mine Lease (SML) area is now undergoing training to be a fitter machinist with the Maintenance Training section. “I am a school leaver and I am very happy with this opportunity that PJV has provided. This is a male dominated trade and some tasks suit the ability of males only. But I try to adjust, associate myself with the boys and try to complete the job within the given time-frame,” Larap expressed. Edward Bele from Paiam is another success story and is undergoing training in Heavy Equipment Fitting with the Truckshop. “I’ve struggled with studies financially and this opportunity is a dream come true. I can see myself being a qualified HEF at the end of my program,” Edward said. Twenty-six of the JRP trainees are now attached with the Asset Management & Infrastructure (AMI) department as Trainee Tradespersons, two are with AMI cranes and the Lube Bay respectively. Thirty-Five are attached with the Mining Department, 11 in the Processing Department and 15 have taken up roles with support service departments. The first 20 intakes for the 2017 JRP program, 15 male and five female, graduated on Friday February 24 on completion of four weeks of basic skills training. It was the sixth sixth graduation of the program. Fourteen of them are already in permanent employment with the mine department, nine are with the open pit and five with the Underground operations. PJV Senior Manager Human Resource and Employee Development, David Lilley, in presenting certificates, said the first year of the program had proven to be successful with positive feedback from departments that have engaged JRP trainees. He told the graduating trainees, the real opportunity starts now and it is up to each one to become successful using this opportunity. “We want this program to continue for a long time and have many hundreds more local people employed by PJV through this program, but it depends on you. When you get to your job, you have to become a safe, productive and highly valued employee,” Lilley said. The manager of the Porgera gold mine plans to have 100 local Porgera locals participate in the Job Ready program for 2017.